Earn up to 31,680 reward points. Larger system package with ribbon technology. This package contains a pair of Peavey RBN112 active PA loudspeakers and a pair of Peavey RBN215 active dual 15” subwoofers. It is a perfectly tuned full-range system that would be a spectacular installation or touring front-of-house configuration. As a DJ system, it provides power and coverage enough to handle medium-size outdoor applications and most function halls and nightclubs. 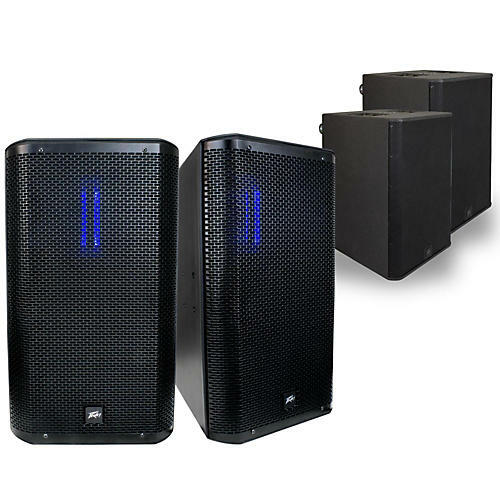 With a total system output of 7000 watts and low-end response to 36Hz, this package PA supplies all of the thunder a rock band, nightclub owner, mobile DJ or any other audio equipment user needs to present their show cleanly and professionally. The RBN 112 enclosure is a top quality, ultra-reliable loudspeaker. Unique to the RBN 112 is Peavey’s world-class ribbon driver. Used in studio environments for decades, Peavey has developed a method for applying this high-quality sound technology to live applications. The result is crystal-clear audio that traditional compression driver cannot rival. The RBN 215 Sub is at the forefront of powered subwoofer technology. The dual 15” enclosure maintains full output down to 36Hz. That is serious low end, and Peavey has always been known for its specifications accuracy. Constructed of heavily braced 18mm birch plywood, the RBN sub is designed for years of rock solid reliability. Incorporating the latest digital signal processing technology, the RBN 215 Sub features two XLR 1/4" combination inputs, a 3.5mm input, and a mic/line level selection. Each input features digital infrasonic high-pass filters, a 9-band graphic EQ and delay. Each output features a sophisticated compressor/limiter and fourth order high-pass/low-pass filters for crossover function and external subwoofer incorporation. Order today and be prepared for larger rooms and outdoor presentations.